The article below was circulated on the Staff bulletin. 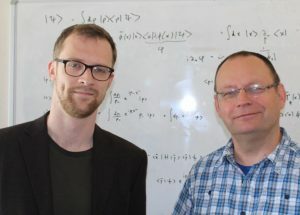 Dr Ben King and Dr Tom Heinzl, both Lecturers in Theoretical Physics, have received the 2016 Editor-in-Chief Choice Award from the journal High Power Laser Science and Engineering (HPL). Their paper Measuring vacuum polarization with high-power lasers (doi: 10.1017/hpl.2016.1) was commended for delivering ‘new and important results’, and the pair have been invited to collect the award and give a talk on their research at the 3rd International Symposium on High Power Laser Science and Engineering in Suzhou, China next year.